This print done primarily with pecan leaves, some sumac and annatto seeds was covered with an iron blanket and processed in a simmering bath. 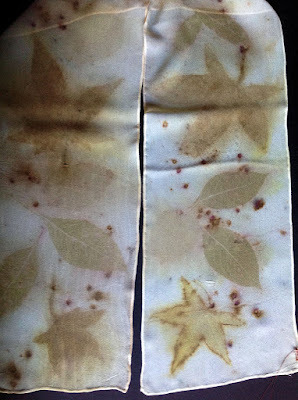 This print done with oak leaves, pine needles and onion skins was covered with an iron blanket and processed over steam. Both pieces were processed for the same amount of time and show, virtually, no real difference in appearance. 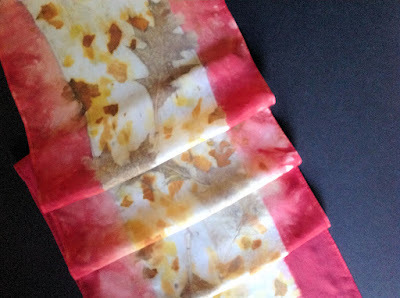 I had also done an experiment using the same young fresh leaves and some hibiscus tea on two different scarves. One was simmered and the other steamed for the same length of time. I found no color difference between the two. I see samples done by others who note they have steamed their pieces and there is definitely leaf coloration in their prints that I am not seeing in mine. All of my test pieces are silk habotai and have been processed in alum in the same way. I’ll continue doing this experiment with different leaves at different stages to see if that is the determining factor. It’s been way too long since my last post but I do have a couple of interesting botanical prints to write about. One of the more difficult fabrics to offer up interesting prints is chiffon. The fabric is such an open weave that the most one can hope for is some interesting (and it usually happens) color. This time, however, a small piece of silk chiffon fooled me. The hamelia leaves as well as the sweet gum did themselves proud. The annatto seeds provided a bit of color. The very vague and disappointing print is a grapefruit leaf. Otherwise, very nice result. The other piece is one that I had promised to publish a couple of weeks ago. It is the scarf that was covered by the iron blanket I wrote about. It is a beauty. Don’t know that I can part with this one. The oak leaves and the onion skins are a perfect complement to the red of the madder root.